Written Aug. 25, 2013 – How long must we continue to suffer? On Aug. 23, 2013, early in the morning, Pelican Bay State Prison Ad Seg (Administrative Segregation) was emptied out and placed on two buses. Every individual on the buses had been on the hunger strike since July 8, 2013, and there was not one medical staffperson on those buses. The trip was an eight hour trip that subjected Lorenzo Benton to extremely low blood sugar. We had to demand that the bus be stopped immediately, which led to a 40 minute delay. They had three cars from SSU (Special Services Unit) escorting the whole trip, but not one medical staffperson, knowing that we had been on a hunger strike 45 days when they placed us on those buses. Lorenzo Benton’s eyes were blurry; he couldn’t see nothing. I tried to take his pulse but couldn’t get one because his heartbeat had dropped so low. We switched position on the bus with Danny Troxell and Frank Clement so that Lorenzo would have more space. This did nothing for him. We asked for water and the sergeant of transportation said he was instructed to not give us nothing but Gatorade. I said, “We can’t have water?” He said no. I said, “Where is the Gatorade?” Initially Abdul, HB and Mutawally demanded that they go back, but I asked how far are we from a medical facility going forward. Sergeant said six miles. We were already on the road 50 miles. I told Lorenzo to gulp down cups of Gatorade because when my sugar is low and eyes are blurry, I just need the Gatorade to clear it up. After gulping down three canteen cups – 12 ounces – each he started to see a little better and he felt better. The sergeant asked him was he all right and if he was going to make it. The sergeant was pissed off that there wasn’t no medical staff on this trip, considering who was being transferred. At least he let us see these sentiments. If he was sincere or not I don’t know. How long must we continue to suffer? Once we got to New Folsom Prison (California State Prison Sacramento) we got nothing, and that is our status right now as I write this. They say on Aug. 26 it will get better. The officials knew we were coming a week in advance, so it is no excuse for subjecting us to such cruelty. We also are receiving low quality vitamins, down from the high quality vitamins that the receivership ordered. [California prison medical services were placed under receivership by the federal court because at least one prisoner a week was dying due to medical abuse or neglect. – ed.] The Gatorade is a better quality, but we are suffering because of what we are being denied, although the hunger strike alone should be enough suffering. But denying us linen – while holding us in ice cold cells – equals torture. It’s obvious that these actions are intended to break us, but the 60 of us have a collective strength and are committed all the way to the force feeding, for better or worse. We can only hope that our strength is a reflection of your strength. All RACES – prison solidarity. We do not care about how much worse our conditions get because the pain and suffering from not eating trumps it all. Also, the only prisoners in PBSP Ad Seg who were left there were Sitawa Jamaa (Ron Dewberry), Todd Ashker, Antonio Guillen and Arturo Castellanos, our four reps. We can only hope that they are safe under those circumstances. Everyone on the bus is medically on high risk status (see CDC Form 114-D), and everyone is doing very bad as well. And it’s old age, middle age and young age prisoners inside that 60, and we can only hope that our strength is a reflection of your strength. All RACES – prison solidarity. We don’t believe that CDCr CSP-Sac can force feed each and every one of us at the same time, because obviously we will deteriorate at the same time. 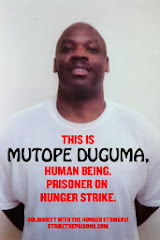 Send our brother some love and light – and writing paper, envelopes and stamps to share: Mutope Duguma (James Crawford), D-05996, CSP-Sac ASU B8-232L, P.O. Box 290066, Represa CA 95671.